April 24, 2017, 1:02 p.m.
By the time Britain goes to the polls on 8 June, Theresa May will have been in post as Prime Minister for almost a year. The current PM&apos;s style could not be more different from that of her predecessor: Cameron’s more cosmopolitan attitudes, slick communications, and “chillaxing” management style is in distinct contrast with May’s caution and more traditional Conservatism. But which of the two do they think is better at the job of Prime Minister? Approaching four in ten (38%) pick Thersa May, whilst just under a quarter (24%) choose David Cameron. A large proportion (38%) can’t choose between them. This is perhaps unsurprising, with the current PM enjoying an unusually long honeymoon period while her predecessor&apos;s time in office ended in resignation when he didn&apos;t win the EU referendum. The choice is especially clear for those who are planning on voting Conservative or UKIP at the forthcoming election, with 69% and 63% respectively favouring May. By contrast, supporters of two of the opposition parties are more likely to say that Cameron was better at the job (Liberal Democrat 47%, Labour 37%). During her time as Prime Minister, Theresa May’s government has jettisoned key Cameron pledges (such as the ban on new grammar schools), whilst maintaining others (like ringfencing 0.7% international aid spending). The new leader has also set out her own stall on issues including executive pay and workers on company boards (although since she appears to have stepped back from some of these policies). 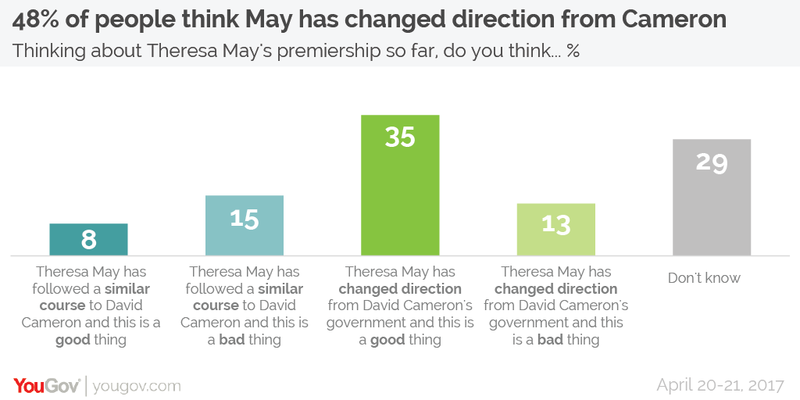 The public certainly seems to feel that the new Prime Minister is charting her own course in government and that it is a positive change.While nearly half of people (48%) think Theresa May has changed direction from David Cameron, this figure is split between 35% who think she has changed direction and this is a good thing and 13% who think she has changed direction as this is a bad thing. 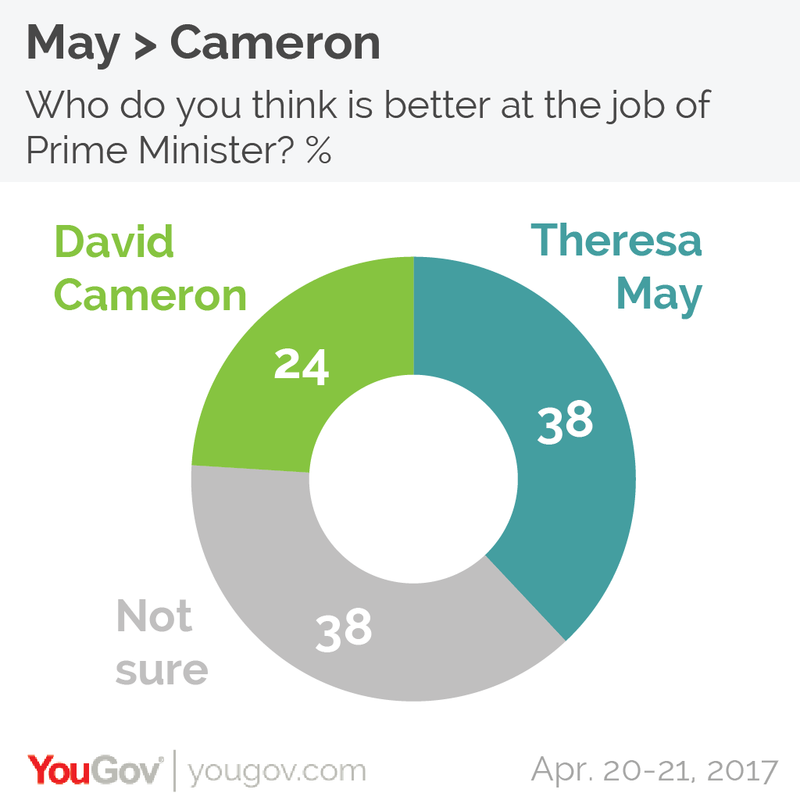 By contrast, just 23% of people think that the see May as continuity from Cameron. This figure is split between 15% who think it is a bad thing that Theresa May has stuck to her former boss’ course and 8% who think it is a good thing.